Disclosure: I received products from Gorton’s for review and giveaway purposes. All opinions are my own, and I was not compensated financially for this post. January is usually filled with many people resolving to commit to accomplishing many new things and reaching new goals. 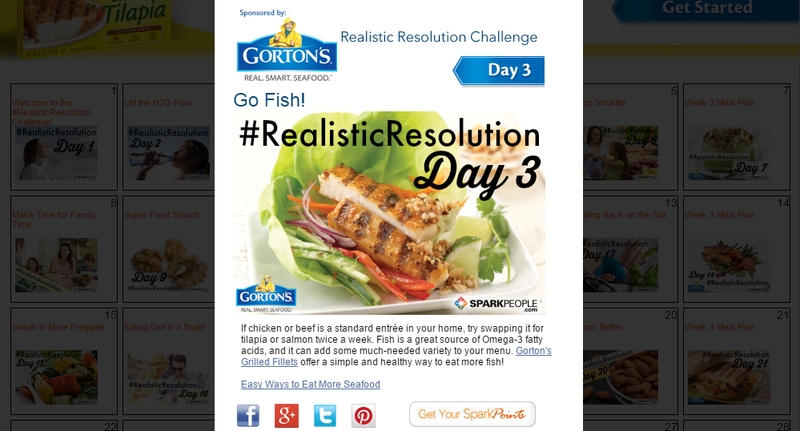 And that is the exact reason why Gorton’s has partnered up with SparkPeople to host the Realistic Resolution challenge. This 30 day challenge is filled with manageable prompts that anybody is able to complete, including meal plans, ideas for how to eat out smarter, and tips for how to drink and snack better. Diet and exercise go hand in hand when it comes to making healthy changes to your routine. Because I’m currently in the midst of half marathon training, it is essential that I fuel my body with healthy, nutritious foods. I had the opportunity to try out some of the Gorton’s Grilled Fish products, and I must say, I was quite pleased with the two dishes that I tried. The fish was already portioned out into individual servings, and it was super easy to pop into the oven and add a side of potatoes and vegetables to. One of the best ways to stay on track with your eating is to vary the recipes that you make. I can’t wait to incorporate recipes from the SparkPeople cookbook. There are so many dishes that have caught my eye. This Creamy-Broccoli Cheese Soup recipe looks perfect for a cold winter day. 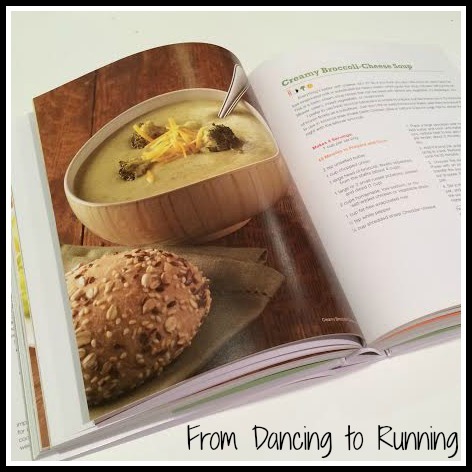 Gorton’s has graciously offered to give one From Dancing to Running reader a fabulous package, sure to help get you going for a great 2015. One lucky winner will receive 2 full-value product coupons, an insulated tote, the SparkPeople cookbook, the Spark book, and the SparkPeople Boot Camp DVD. Be sure to enter my Rafflecopter giveaway for your chance to win this amazing package! This giveaway is open to U.S. readers 18 years of age and older, and will end at 11:59 pm on Tuesday, January 20, 2015. 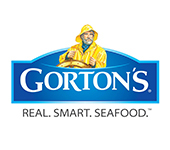 Download a coupon for $0.75 off any (1) grilled Gorton’s item. Enter the Gorton’s Eat Smarter Sweepstakes to enter for a chance to win up to $5,000! Like/Follow Gorton’s on Facebook, Twitter, Pinterest and Instagram and reach out to them using hashtag #RealisticResolution. QOTD: What is your resolution for 2015? 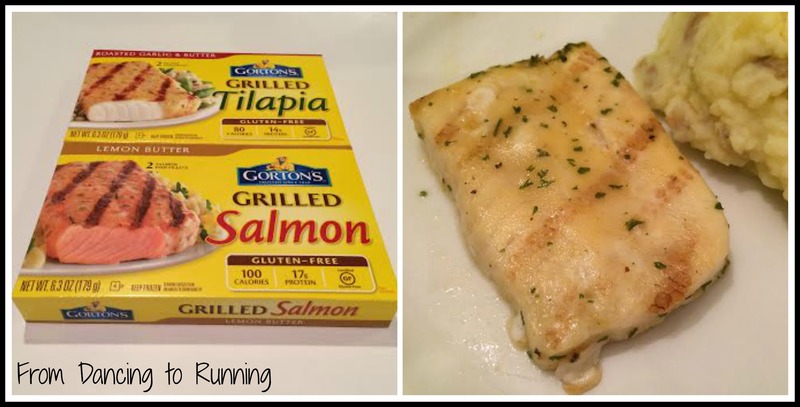 This entry was posted in Miscellaneous and tagged giveaway, Gorton's seafood, product review, Realistic Resolution, SparkPeople. Bookmark the permalink. I never do resolutions because they always get broken. However, I do stick to a healthy lifestyle most of the time and exercise has always been a priority. However, next week when I get on the cruise boat for 10 glorious nights in the Caribbean, all bets are off on what I will eat! Ooh, that soup looks yummy. I just got an all-soup cookbook from my mother-in-law and am loving it. My resolutions include drinking more water and getting more protein daily! No resolutions here, but I am shifting my workouts based on what my PT wants me to do. So far it’s working, which keeps me motivated to keep the new stuff. I used to eat the heck out of some Gorton’s! I tried Gorton’s fish and it’s pretty good! And that soup sounds great! The soup looks good! I’ve never tried the Gorton’s grilled products – I should give it a try. My resolution is to no longer eat restaurant food. My healthy resolution is to cut waaaaay back on the wine this year. So far so good! I have a ton of things I want/need to do, but passing boards and setting up my 4th year rotation schedule are at the top of my list! Going to the gym 3x a week is one of my goals! I haven’t made a resolution for 2015. My resolution is to take better care of myself, body and mind, by eating better, exercising more, relaxing and having more fun. I am resolving to take more time with my family and making memories.